Flip 5 is only a 2 bedroom house. In a small house, it’s important to make very specific design & organization choices. 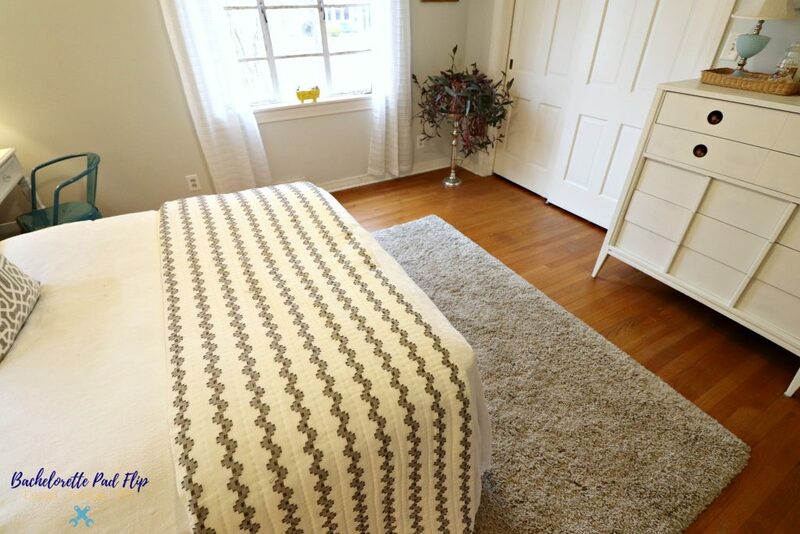 Luckily, of the two bedrooms, the guest bedroom is the largest of the bedrooms. 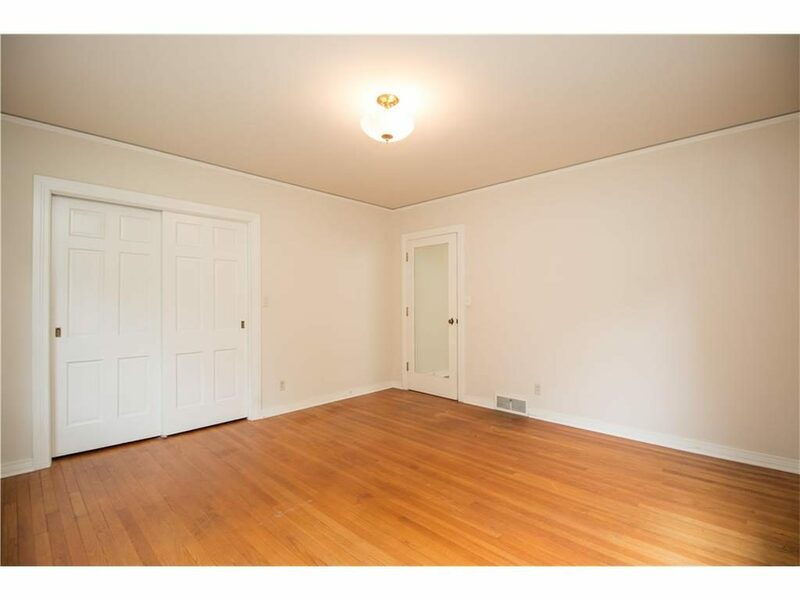 With ample square footage, it made staging a lot easier. The challenge was that this room had to serve a dual purpose: guest bedroom and home office in one space. I started with a blank slate. I could have easily fit a queen size bed in this space and still had room to create an office (this bedroom is that big), but I’m actually using a full size bed because that’s what I own. And I never have guests unless it’s a nephew staying the night. For me, the part of this room that was going to be used the most was the office since I work from home. I know that home offices tend to get cluttered and messy, and we don’t want guests to see them…but I’ll give more tips on that in a minute. 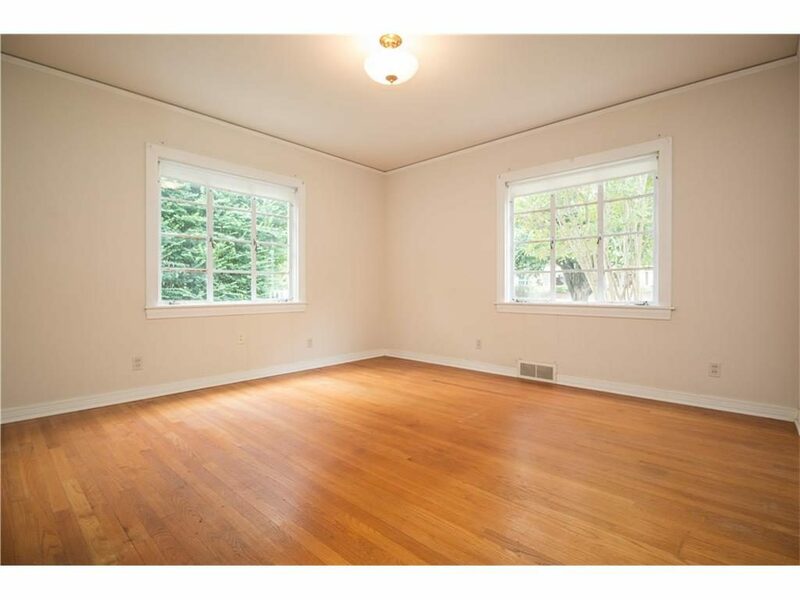 This room gets tons of natural light with the dual windows, and it faces west. 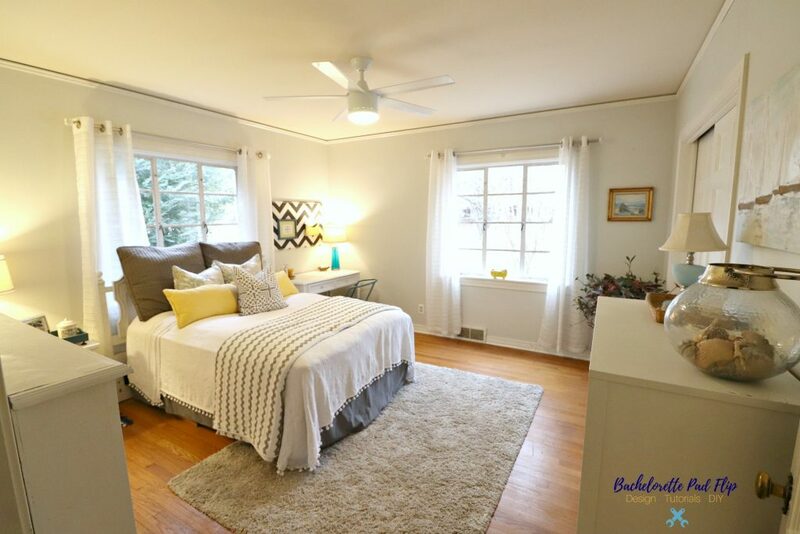 I certainly wanted this dual room to feel light and bright and not cramped since it was serving multiple functions. As far as changes to the room, much like the master bedroom and dining room at Flip 5, I did very little. 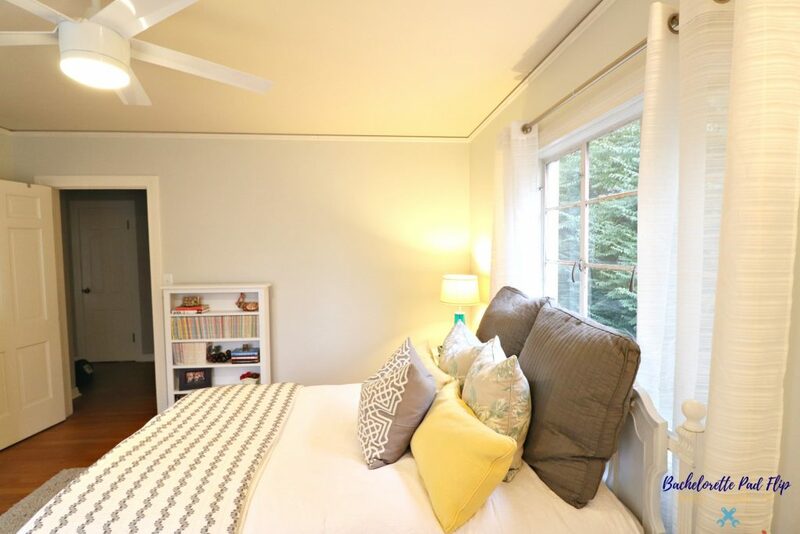 I put a fresh coat of my favorite gray on the walls and replaced the light fixture with a contemporary ceiling fan. 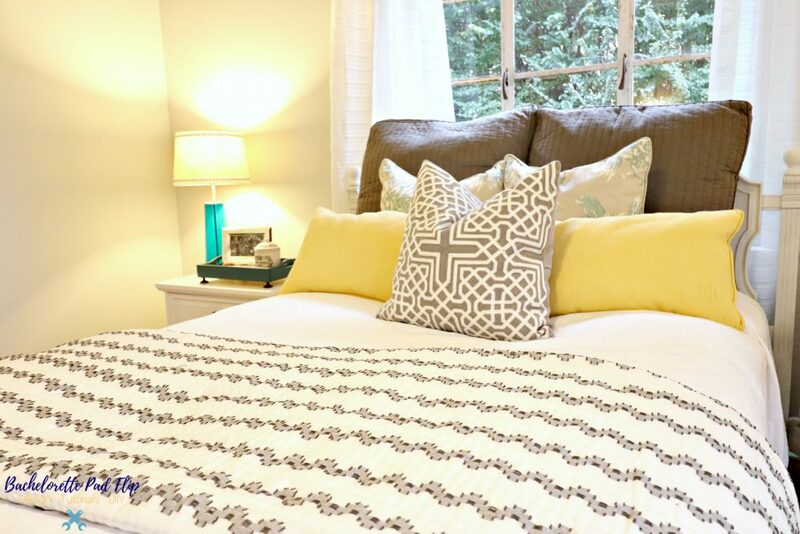 Even though the guest bed will be rarely used at my house, if you do have a guest bed, decorating it to look and feel relaxing will be much appreciated by your guests! I’m always a fan of using neutrals in bedrooms. In the master bedroom, you may recall I used shades of blue. For the guest bedroom, I wanted to play off my obsession with the beach by incorporating teals and yellows. When using bold colors like teal and yellow, I prefer to use them as accents (pillows, artwork, throw blankets, etc) rather than dominant staple items. Using an easy to wash bedspread (with pom pom fringe!) and layers of cozy blankets, when the nephews do crash here for a night, they have a very cozy place to lay their head. I also always place a patterned bedspread at the foot of the bed to not only add additional color & design, but for guests’ convenience. I thrifted this patterned one, and it’s so cozy! And, of course, I use all the throw pillows. This is where you can get wild with pattern & color! I’m a big fan of using lamps in spaces because I think they create a cozy and warm atmosphere. I picked up two glass teal lamps at a local thrift store for $4 and found the drum shades at another thrift store for $3. Lamps can be a really inexpensive way to add design to a space since they come in such a variety of materials, sizes, styles, and colors. 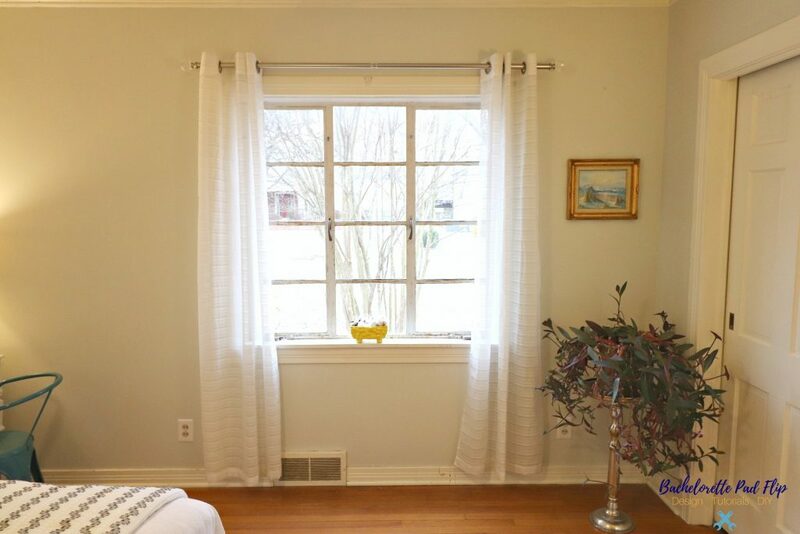 I debated using gray or muted teal curtains, but I love the look of sheer curtains and how the light passes through them, and, it didn’t hurt that I found four matching white sheer panels at a thrift store for $10! I love the character the original windows bring to this house. Aren’t they great? Using some curtain rods I got at TJ Maxx for $10, they were the perfect touch for my thrift store curtains. And while I’m no green thumb, my beloved Purple Queen is one of the few plants that I can not only keep alive but it thrives! I bring it in during the winter and baby it, and then let it soak up all the sun outside during the summer. Did you know that houseplants not only improve the air, but they also help to create relaxation? So try incorporating a houseplant or two in your guest room. Creating a desk area that also created style in the space was a little tricky. The primary key is to pick a desk that doesn’t look commercial. 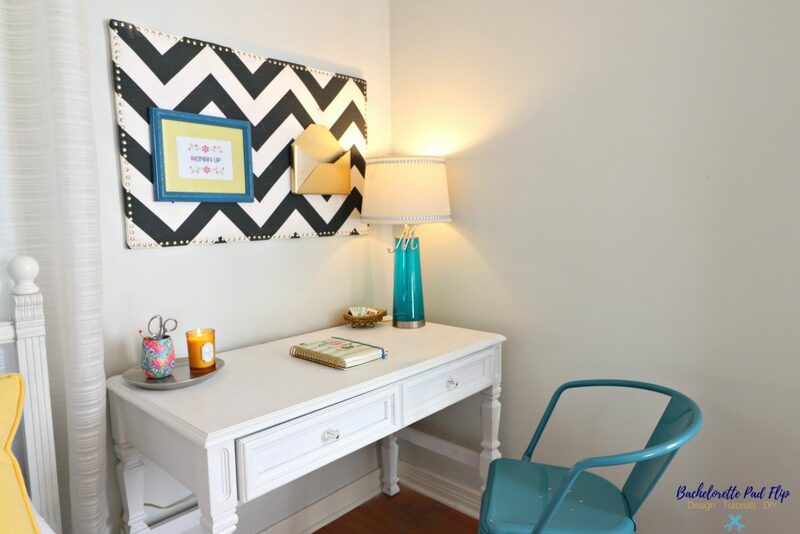 I’ve seen so many cute & simple desks that provide style and function. I scored this desk years and years ago on Craigs List for $25. I’ve given it a couple different coats of paint, but I think the simple white is my favorite. While I had a bedside table on the other side of the bed, I placed the desk beside the bed like another bedside table. Even though they are differing styles and heights, I wanted to create some sort of symmetry in the design. The hardest part about a home office is keeping a clean & organized area (I’ll be doing another post about home office organization tips! ), so rest assured, the desk doesn’t look like this on an average day- but I try! Even though I’m doing a separate post about home office organization, I’ll give you a little sneak peek. Just like I did in the dining room, I get creative with storage. I didn’t need a clothing chest of drawers in the guest room that’s rarely used, but it provides great additional (out of sight!) storage for office supplies, files, etc! I thrifted this one a few years ago and gave it a coat of fresh white paint. In Flip 3 it served as the TV stand, so it has definitely got quite a bit of use over the years! I mentioned I wanted to create a beach vibe in this room. I mean if I can’t BE at the beach, I might as well be able to FEEL like I’m at the beach…especially while I’m working! 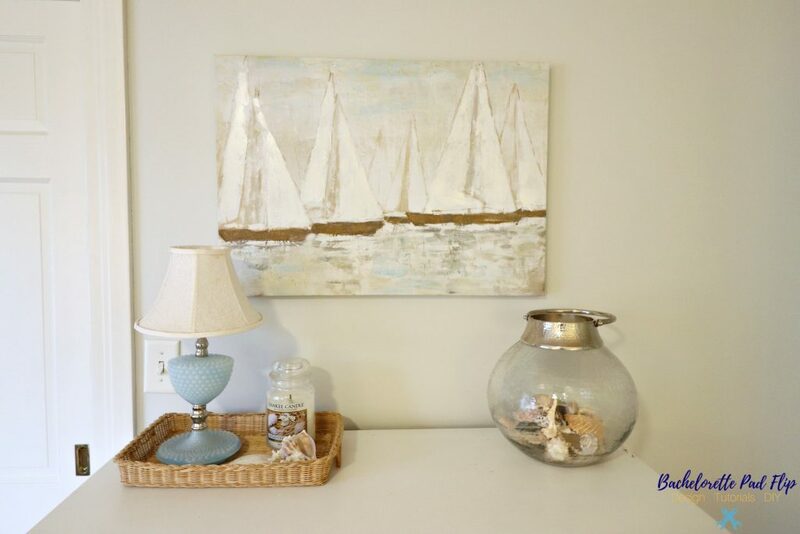 Using several shells from my beach trips, I used those as accents to bring the beach to the bedroom! I scored the oil & sand painting on clearance at Cracker Barrel. I wish this picture did the painting more justice. The colors are so vibrant and beautiful, and I love the sand texture. 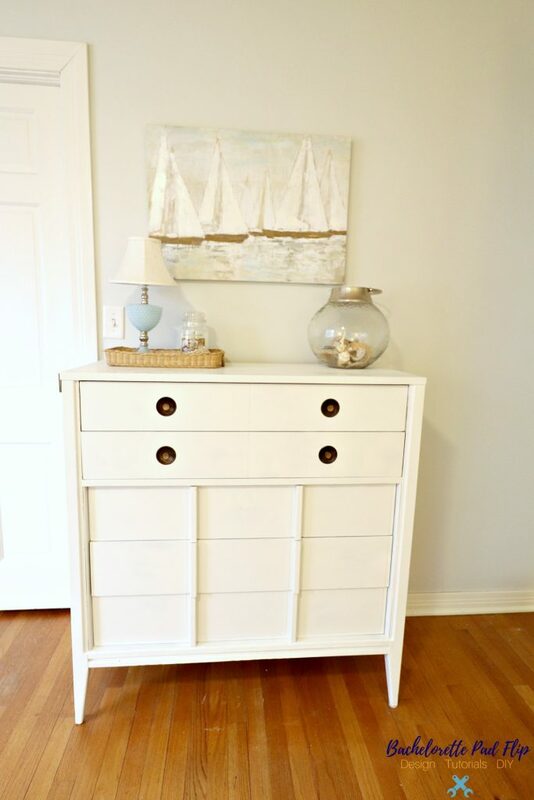 It’s the perfect beachy accent to the space! The tiny blue lamp was my grandma’s, and I love the subtle color and size of it! Having a dual purpose bedroom and home office isn’t ideal, but it’s not all that unusual. 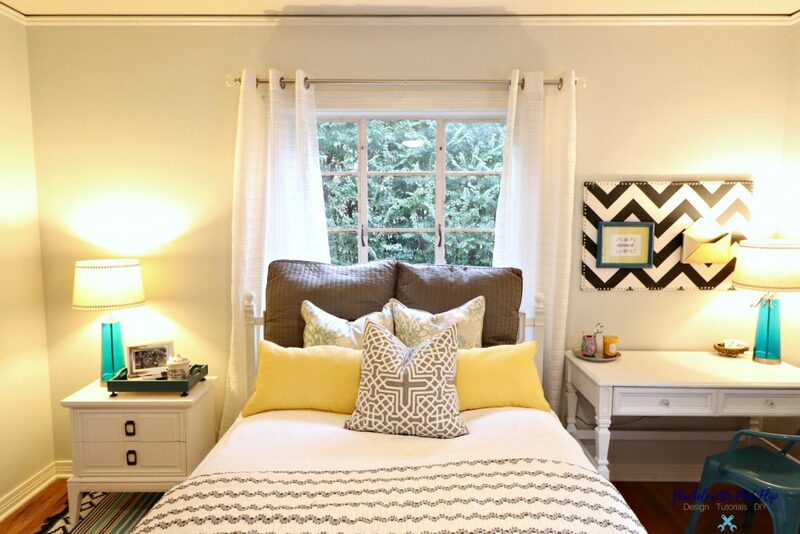 Apartment living, small homes, or cramped spaces often require dual purpose rooms. I wanted the office area to feel like an extension of the bedroom design– not a random afterthought that didn’t flow. Incorporating the same colors and styles and themes help to accomplish that goal. The hardwood floors, although not refinished yet, are absolutely beautiful! And I didn’t want to distract from those original hardwoods, but in such a large room, I wanted to soften the room, and this extremely plush (seriously, so soft!) greige carpet broke up the space and added some comfort too. Another area to enhance a style, design, or add pattern or color is with area rugs. They are easy to add and rather affordable, and while I chose a very monochromatic neutral rug, there are so many great patterned rugs on the market. I get asked from time to time (usually after seeing my bed! )- is it possible to have too many throw pillows? Ha! I’m a big fan of them…obviously. Seriously, I buy a lot of pillows each year. 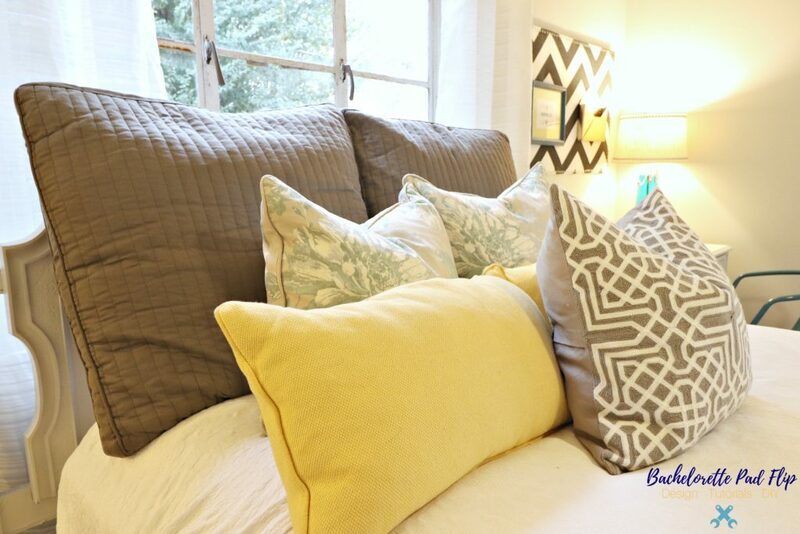 They provide texture, color, pattern, and function…all essentials in good staging. Most of these were TJ Maxx scores, except for the Ralph Lauren yellow ones which I scored at an estate sale for $2! Layering and staggering them creates such a cozy & welcoming bed. They say the devil is in the details. And as hard as I work at the details, sometimes they just work themselves out. 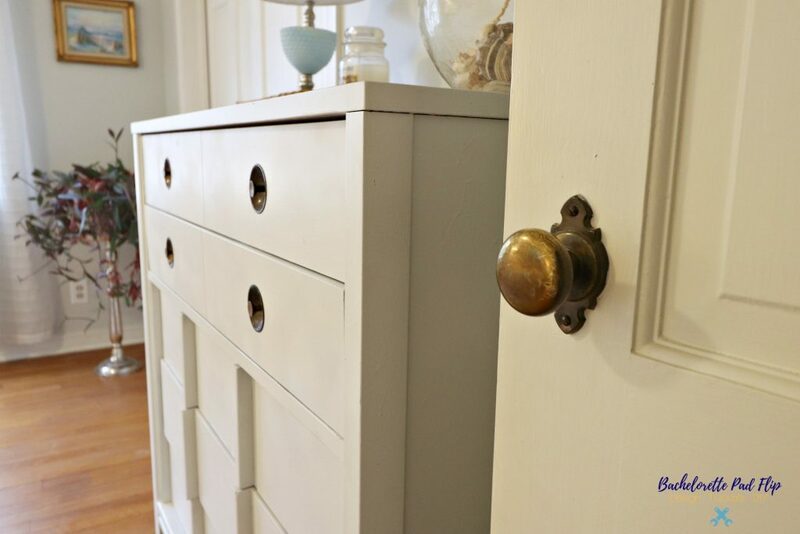 I didn’t realize until I was done with this room that the original brass door knobs match perfectly with the midcentury concave drawer pulls on the Craigs List dresser. Sure, 99% of people won’t ever notice that, but I do…and I love the cohesive feeling it brings. As always, my motto with designing, you don’t have to spend an extraordinary amount of money to make it look good. Using what you have, accenting with some new items, and repurposing hand-me-downs, makes creating a cozy, stylish room rather easy. And making a dual purpose room doesn’t have to be a challenge either! I wish it was AT the beach! Was wondering about this flip – have missed your updates. How’s the kitchen coming along ? This bedroom/office combo is a cozy solution for this guest room. Looks really nice ! The kitchen WAS done…and now I’m having to repaint the cabinets (long story coming soon)! So it’s almost done…again.